I don't think I have ever had so many requests for a single product like this! It was within one week that I got over 100 requests to try out this peel off mask. Have you heard of it? The Black Mask is by a company called Shills. They are based in Asia and have a few other skin care and cosmetic products. It has gone viral showing tons of videos of women trying it and seeing tons of blackheads and nasty stuff that was once in their pores now on the mask. So before trying it I did what I normally do and consulted with a skin care professional. I talked to my skin therapist Ayla about the mask. She basically said that most blackhead strips and pore strips aren't effective at all. Your pores clog with oils and dead skin cells and the air dries out the top layer of it (closest to the opening of your pores) and the dried out dead part turns black, which is what we consider a black head. While the dried black crust that used to be at the opening of your pore is on your pore strip the pore is still full and soon the remaining gunk will dry out on top and create a new black layer. She told me that she had seen commercials and youtube videos where the mask had been very effective. She basically told me that when I do my test what I need to look for is if the mask just has some whitish/black dots on it, or is it has full lines of sebum and dead skin cells, consistent to what you might see when you pop a black head (which she doesn't recommend doing by the way). So then off to step two of my test. I looked for a place to buy it from. I looked at three sources. Amazon, Shill.com, and WISH. I actually bought two. Most of the people I have seen have purchased the item off of WISH, which is an app that usually has bargain items. I was worried that it would be fake or expired product. I bought from WISH ($6) and from Shills.com ($10). I have to say both products seemed to be the same. They looked, smelled and felt the same. You can also get a great deal on it at My Scheming UK where it is £5.00 or $6.26. So step three was trying it out. I have fairly clear skin. I mean I am not acne free but in the way of black heads I only have a few. So I went ahead and did it on myself as well as my very cooperative husband (don't worry, I made him cookies in exchange). He has very large pores and constantly has blackheads. We both used a high quality cleanser (Purity by Philosophy) and then proceeded to put a fairly thick layer of the mask on our skin. I did mine first, and honestly I didn't see much of a difference. 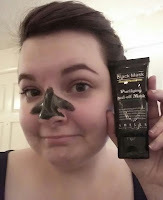 I only counted 4 blackheads before I put on the mask and only one was gone, and I didn't see the long white tail (which is what the sebum and buildup look like) come out with it. However my skin felt soft and smooth. Then my husband did his. It says on the directions to leave the mask on for 20-30 minutes. I left mine on for almost 30 minutes, he however took it off at 25 minutes. I did feel like he could have used a little more time, there were a few places where it hadn't dried all the way. Although it was 95% dried so I didn't feel like we had to try it again. I would say about 80% off his blackheads were gone. However it was just the top layer. I only saw 3 longer white trails. I don't think this mask works better than a Biore pore strip, however I don't think either of them work well at all for anything other than getting rid of the black crust, not actually cleaning out your pores. 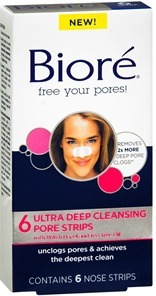 However it is a lot less painful to take off than the Biore Strips, and it is easier to use and more pleasant. It is also a lot less expensive. Did your Shills have a safety seal? Mine does not.I'm afraid to use it. Mine did not, and neither did my sister's. Mine didn't either. The real box looks different as well. Umm you're advertising a website selling fake Shills products. www.shills.co.uk is where you get the GENUINE Shills black mask, which comes with a holographic authenticity sticker and a serial number. I know you get paid to write these articles but it's worth doing some due diligence before agreeing to advertise what's ultimately a dangerous product without any certification. Hi, I understand your frustration. I actually do NOT get paid to write these articles. I write articles based on my own personal products that I want to try, what people ask me to try and what is trending. I write this blog because it is FUN and I enjoy it. Unlike other blogs that produce 2-10 posts PER DAY, often repeating the same posts over and over again, I do not. I do maybe 3 per week, and often go weeks without posting any at all. You will notice my blog does not have ads on it either. While I have accepted some free samples in exchange for a review, those samples come with the agreement that if I do not like the product it will still get an honest review (and I have published 2 honest reviews on products I didn't like and got for free). My Scheming UK is a place I have personally purchased multiple products to test as well as to compare to the real deal. I am a fan and a customer of their site, and that is why I recommended it. I have purchased the mask from them and I found it to be the same in texture and performance.